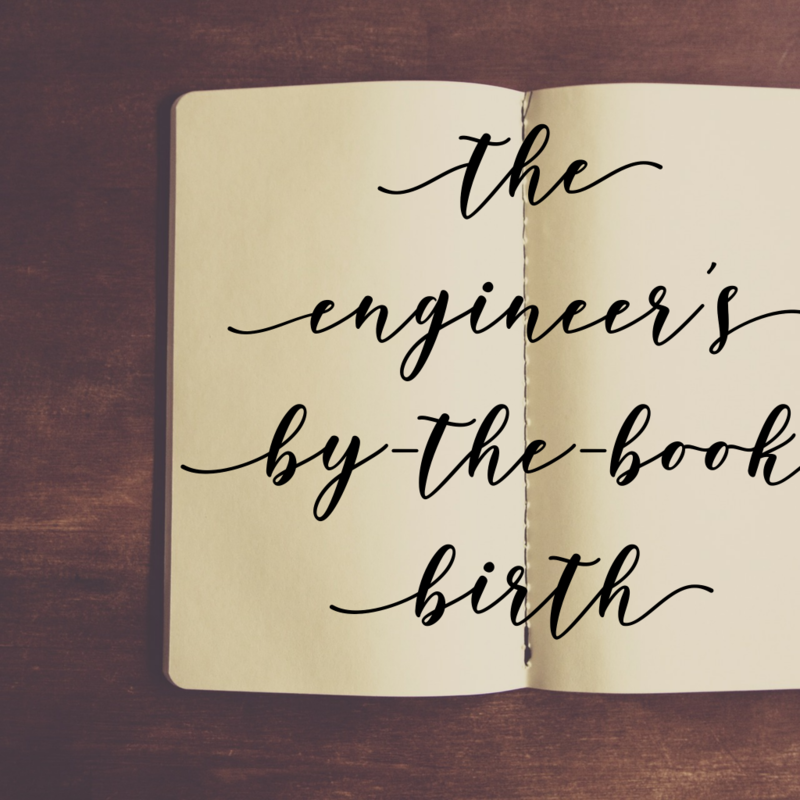 One would think that in the two years between the Ballerina and the Engineer, I would have read more about childbirth and dealing with the pain of contractions, but I didn’t. Life was full of other, more pressing things. Not just my teaching, but the extra full-time job of parenting a teen who struggled with school and making good choices. I’ve sat on both sides of the parent-teacher conference table, and I’ve had to both give and receive bad news about a child. Childbirth is easy in comparison. What a difference it makes when birth goes like it’s supposed to: no complications, no bleeding, no near-death experiences! I never gave any thought to natural childbirth with the Engineer. I’d felt hours of contractions with the Ballerina, and they were enough to last me a lifetime! I told Dr. K that I wanted an epidural as soon as possible in the process–end of discussion, end of plan. Pitocin? Didn’t cross my mind. I had three goals: vaginal birth, no episiotomy (and hopefully no tearing), and healthy baby and mama. My 40 week appointment landed a few days before my due date, since I was due on a weekend (and Halloween). I felt good. I didn’t have the swelling in my ankles and feet I’d had with the Ballerina. My blood pressure was good. My parents had even bought me a blood pressure monitor for home, so I could keep track of it daily. I’d had some more intense Braxton-Hicks contractions that week, but nothing that didn’t go away immediately if I stood up or sat down or walked around the house. I wasn’t sure what to expect of early labor, even though this was my second rodeo. Dr. K found me partially dilated (a 2 or 3, I think), and discovered that I had a very small, high leak of amniotic fluid. I’d also lost my mucus plug, probably early that morning when I was too tired to notice. She sent me home to get my bag, arrange childcare for the Ballerina, call my husband, and come on back. I was already in early labor, and active labor was coming. I was back at the hospital before noon, and it wasn’t long before I could feel regular contractions start. 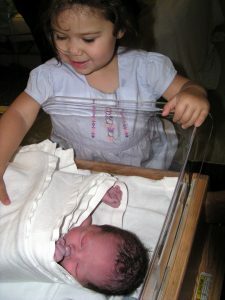 When they became uncomfortable, I was happy to have that epidural put in. I have to say, when it works, it makes labor easy. So easy; I read a good book until it was almost time to push. I know many articles and birth books talk about how epidurals slow down labor, make pitocin necessary, and lead to c-sections. When I consider that I started feeling labor around 1 pm, and the Engineer was born after less than twenty minutes of pushing at 6 pm (right on the dot; we had double nurses present because it was shift change), I didn’t think it slowed me down. My entire labor was about 5 hours, unless we count the labor I couldn’t feel before that (do you count labor you can’t feel?). And there was the Engineer. Remember that we had double nurses there? Yup, my newborn son peed all over both shifts as they weighed and measured him. He looks thoughtful, but this was the only picture of his first hour where hes not screaming at us all. He wanted nothing to do with this bright, loud, cold world. It took him two years to adjust to it. What didn’t happen after he was born was bleeding. The cyst that had caused all the trouble after the Ballerina had disappeared as the uterus shrank. When I became pregnant again, it reappeared. 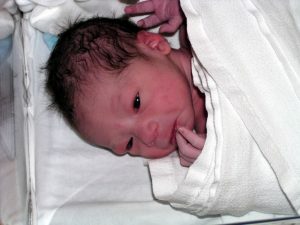 In the aftermath of birth, Dr. K was able to quickly remove it and suture the site. It never reappeared, though we had ultrasound techs check for it with each of our next two pregnancies. That part of my life was gone, and I doubt we will ever know what caused it in the first place. If I take away the learning curve needed to care for the Ballerina, the Engineer really was my hardest baby (so far . . .). He wasn’t colicky or anything, but he was easily overwhelmed. Too much light, too much noise, or too much activity left him overstimulated and crying. He wanted life to be like before: warm, dark, and quiet except for some nice, rhythmic white noise. I used to swaddle him up, warm an extra receiving blanket to put on his back, and rock him around the kitchen with the vent fan on high. It was the best way to get him to sleep. Baby wearing and co-sleeping had made things easier with the Ballerina, but I can’t imagine parenting a baby like the Engineer without them. She liked them; he needed them. The Ballerina was thrilled with her baby brother until she discovered how noisy he could be! Though the epidural didn’t stall my birth, I did get to feel the after effects. I itched horribly for most of the next day (try sleeping through that), and I was headachy. As much as I liked the pain relief, I didn’t like the side effects. At the time, I didn’t know what the options were, and I didn’t think I’d ever be able to handle a natural labor. I still thought of labor as the hard, fast, unrelenting contractions I’d experienced with the Ballerina. I never wanted to experience those again!